21st Feb 2018 is the last date to apply. You can check out the website of this Baqai Cadet College. Visit this website and then you can proceed yours application form processing phase. On the date of 25th Feb 2018, you will have your entrance test. Test timings are 9:00 am and this test will be taken at this Baqai Cadet College. It is one the basis of your written test score, score of your interview, and marks in your medical examination test that your merit will be finalized. For class 7 admissions, your age has to be in between the criteria of 11 to 13 years. You should have cleared your class 6 exams and papers. If you are sooner going to be appeared in your class 6 exams then you can apply in this college too. In this situation, you have to attach a hope certificate with your form. For class 8 admissions, your age has to be from 12 to 14 years. It is must for you to clear your class 7 examination. 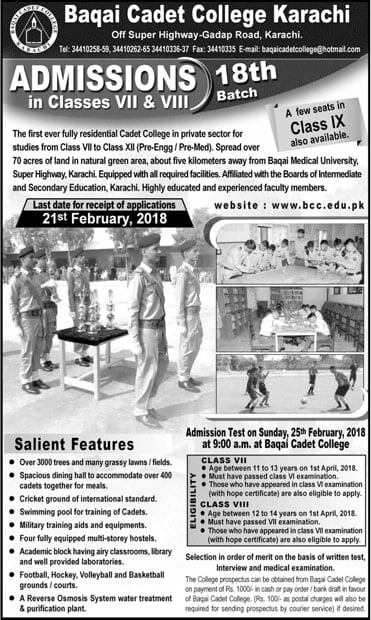 If you are going to and about to appear in your class 7 exams, papers then those candidates can apply as well in this Baqai Cadet College. With respect to this situation, you have to show and do attach yours hope certificate right with your application form. Why to Choose Baqai Cadet College? This college consist of many of the grassy fields as well as lawns. It has over and about 3000 trees in its premises. It has spacious in amount of dining halls. These dining halls can easily accommodate almost 400 cadets in one single time during meal and lunch time. They have large cricket grounds and that too of international standard. For the proper and complete training of cadets, this college is packed with international standard swimming pools.